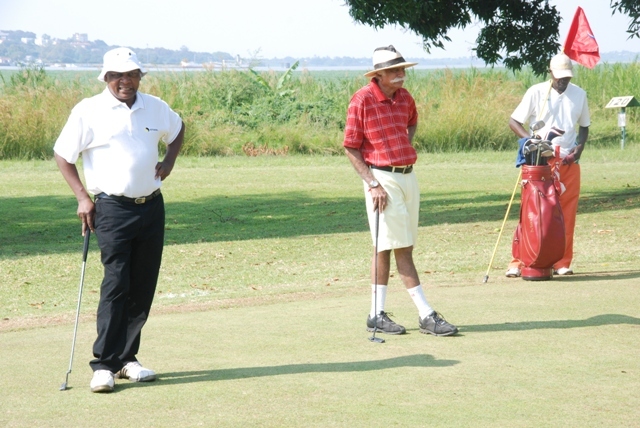 Players at the eighth green facing Lake Victoria during the Dasani Golf Gala held at the Nyanza Golf Club on Saturday. Home player Samuel Nyamweya posted the best score during the 14th leg of the ongoing Dasani Golf Gala to anchor his team to victory at the nine-hole Nyanza Golf Club on Saturday. The team emerged the winners with a combined score of 116 points thanks to Nyamweya’s contribution of 47 points as they booked an automatic ticket to the finale, while Geoffrey Obol playing off handicap 27 posted 37 points and handicap 25 George Odongo had 32 points. Lucas Nyambogo playing off handicap 10 was the team’s weakest link on 30 points. Speaking on behalf of the team, Nyamweya said he felt honoured to have won the tournament and vowed to maintain the same during the grand finale set for Karen Golf and Country Club on September 29. The tournament brought together players from Nyanza, Mumias and Kakamega. “It is a great honour to have posted the best score in such a big tournament and we will not let Nyanza Club down come the Grand Finale,” said Nyamweya. The second team to qualify was made up of handicap 12 H. S. Sokhi, handicap 17 J. C. Lee, handicap 17 Sam Deya and Wycliff Nyambogo playing off handicap 29. Sokhi posted 40 points, while Deya contributed 39 points and Lee had 30 points. Nyambogo was the team’s weakest link on 29 points. The reserve team was made up of R. Karia (39), Jiten Pabari (37), B. M. Shah (31) and P. Thakrar (29) with a combined score of 107 points. Peter Kibuku of Sigona playing off handicap 26 was the guest winner on 32 points. Speaking at the function, Normah Asimba, the Public Relations and Marketing Manager of Equator Bottlers said the grand prize this year will see the winning team of four players travel to Dubai to attend the Grand Finale of the European Tour, the DP World Tour Championships at the Jumeirah Golf Estates. While in Dubai, they will also have the opportunity to see Europe’s top 60 money earners on the 2012 Order of Merit battle it out for a 1.3 million winner’s cheque. Course at the Emirates Golf Club, a course designed by former world number 1 and six-time major Champion Sir Nick Faldo,” said Asimba. This entry was posted on Monday, August 20th, 2012 at 10:02 AM and is filed under Golf News. You can follow any responses to this entry through the RSS 2.0 feed. Both comments and pings are currently closed. Can a Kenyan win the 2018 Barclays Kenya Open Golf? Design and Hosting by BigHostWeb.com.